The Northwest Lancaster County River Trail is a 13.5-mile, multi-use, public recreation trail that meanders along the banks of the Lower Branch of the Susquehanna River. The trail spans five municipalities, as well as land owned by the County of Lancaster and the Lancaster County Solid Waste Management Authority. Views of relics of the historic Pennsylvania Mainline Canal towpath, which the trail follows, including abandoned canal locks, iron furnaces, and an old quarry at Billmeyer can be seen along the trail. "The northern 3.75 miles of the trail between Falmouth and Bainbridge is known locally as the Conoy Canal Trail. It runs along the Conewago Canal, part of the original Mainline Canal, that was built to bypass Conewago Falls on the Susquehanna River. On route, you'll see original stonework in the form of old bridges and locks." The trail’s southern half runs through Marietta and winds through Chickies Rock County Park, which offers more than 400 acres of woodlands and meadows. The section through the county park goes by the name of Susquehanna Heritage Trail and ends with a trip through an old railroad tunnel called the Point Rock Tunnel. In the park, be sure to take the spur up the Chickie Rock Overlook Trail, a 100-foot-high rock outcropping for spectacular views of the river. In Conoy Township, parking is available at the Falmouth Boat Access. From Route 441, turns onto Collins Road. In Bainbridge, parking is available at American Legion Park, located where Race Street ends at the Susquehanna River. A portable toilet is also available there. 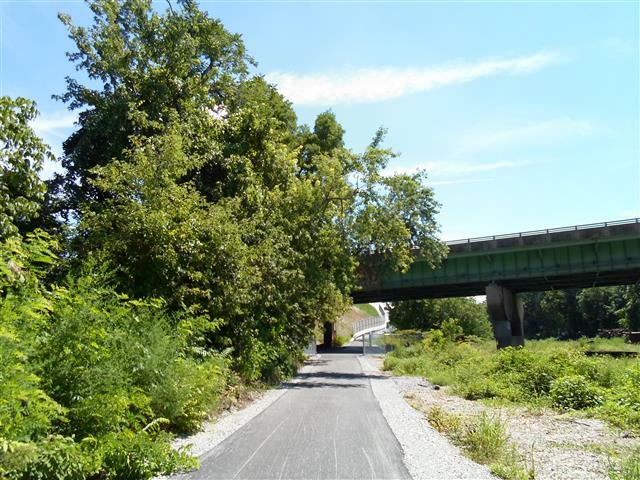 In Marietta, parking is available in Riverfront Park, the Decatur Street Trailhead, and the Furnace Road Trail Head.